from 60 pcs. 0,15 EUR ea. from 140 pcs. 0,14 EUR ea. Topseller: More than 700 000 sold! 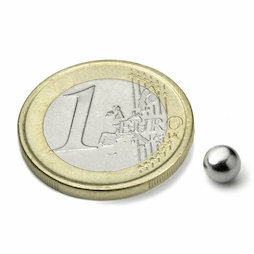 Nickel-plated small sphere magnets for endless combining and experimenting. Available in units of 20 (minimum order quantity is 20 units). Caution: Due to the dangers of swallowing magnets, these small spheres (as well as all super magnets) are not suitable for children under 14 years of age. The swallowing of two or more magnets may be fatal. Even though those magnetic spheres are often advertised on the Internet as toys, please take this warning seriously and keep the magnets at a safe place out of children's reach. The little magnetic spheres have a diameter of 5 mm. The spheres are triple-coated with nickel-copper-nickel (as opposed to the chrome-plated spheres K-05-C). They are N35 magnetised - therefore slightly weaker than the other sphere magnets in our assortment. However, the slightly weaker magnets are perfectly suitable for experimenting and testing different arrangements. They are also really affordable. This video shows some of hundreds of possible uses of a large number of these sphere magnets. View this video with speakers turned on - it's worth it!